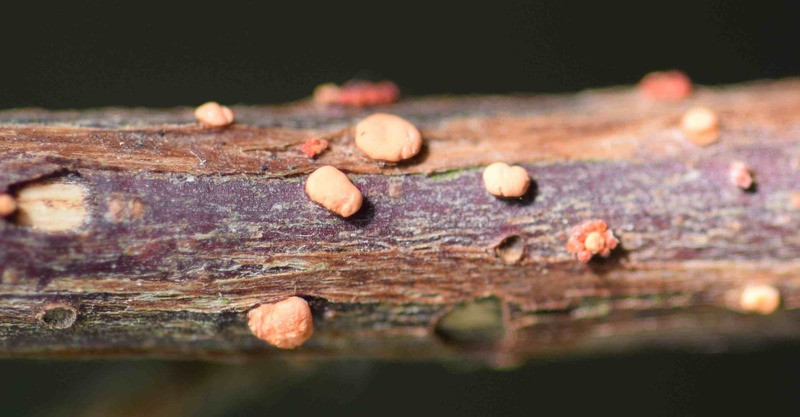 If you are doing any pruning or trimming of shrubs in the next few months you are very likely to find this little fungus. Aptly named coral spot for the colour and shape of the fruiting bodies, this fungus is chiefly remarkable for not having had its name changed – it is still the Nectria cinnabarina that it was when I first learnt it! 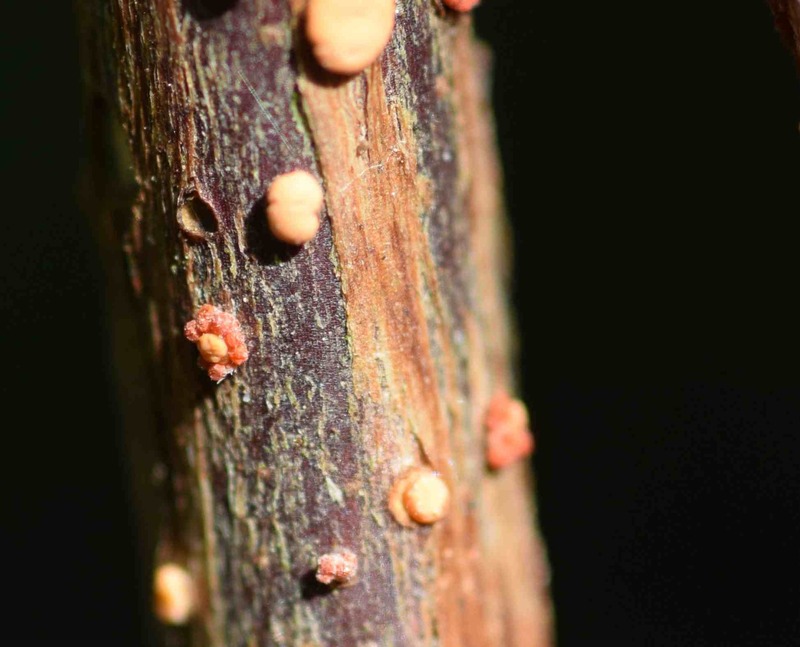 It is very common on beech and hornbeam, especially hedges where there are lots of cuts and snags, but it can be found on many shrubs and my sample was on an old ribes. It is a saprophytic fungus, meaning that it lives on dead plant material but it can also invade living tissue. It is also very common on chaenomeles, the plant I associate with it most. Because it mostly infects dead plant tissue it can be found on woody twigs and debris laying around the garden including bean poles and pea sticks. 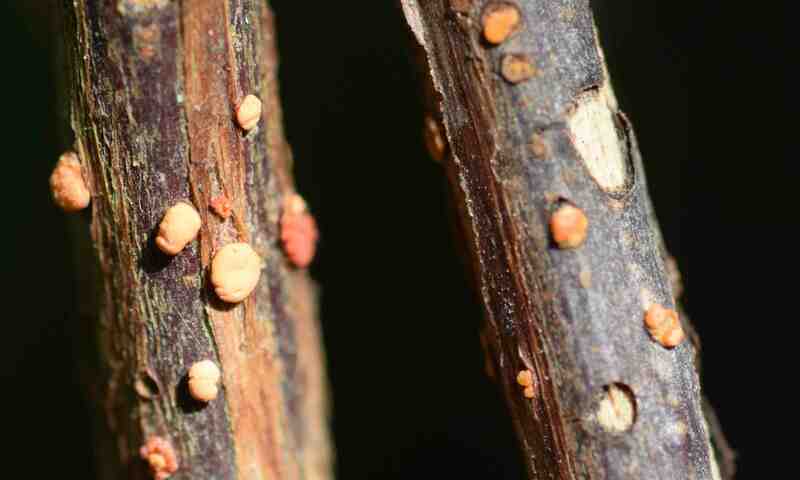 The fungus lives within the wood and the fruiting bodies appear throughout the year – you can see one bursting through the bark in the photo above. There is no chemical control for the disease and the best thing is to cut out affected areas before they cause dieback of live tissue. It is recommended to prune in dry weather rather than wet so the spores do not land on cut surfaces and germinate immediately.